Dhole is a species of wild dog that has declined dramatically across its extensive range. It is now classified as a globally endangered species with fewer than 2,500 mature individuals remaining. 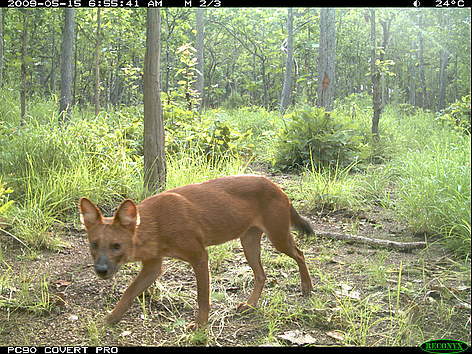 In Cambodia, dholes occur in both protected areas co-managed by WWF in the Eastern Plains Landscape. Competition and disease transmission from domestic dogs are a threat to this species, which is why WWF-Cambodia is enforcing a rigorous “no dogs”-policy in the strict protection zones of its protected areas. After an outbreak of canine distemper in 2011-2012, thought to have been transmitted from local domestic dogs, the populations are slowly recovering as of 2015.